or go to Organization > Exchange > ActiveSync Policy. First, you can decide whether you would like to allow non-provisionable devices, and set refresh interval in hours. Secondly, you can allow or prohibit attachments to be downloaded to device, and specify maximum size of attachment in KB. Then you can enable or disable Windows File Shares and Windows SharePoint Services. Finally, you can decide about password. If you check Require Password, you will see the list of settings. You can Require alphanumeric password, Enable or disable password recovery, Require encryption on device and Allow simple password. 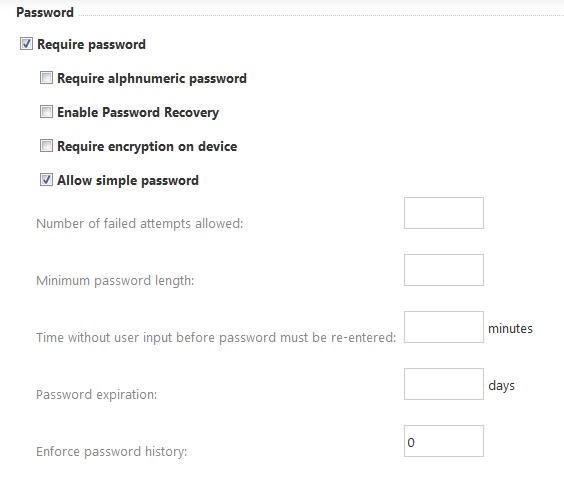 Then you can specify Number of failed attempts allowed, Minimum password length, Time without user input before password must be re-entered in minutes, Password expiration time in days and Enforce password history.